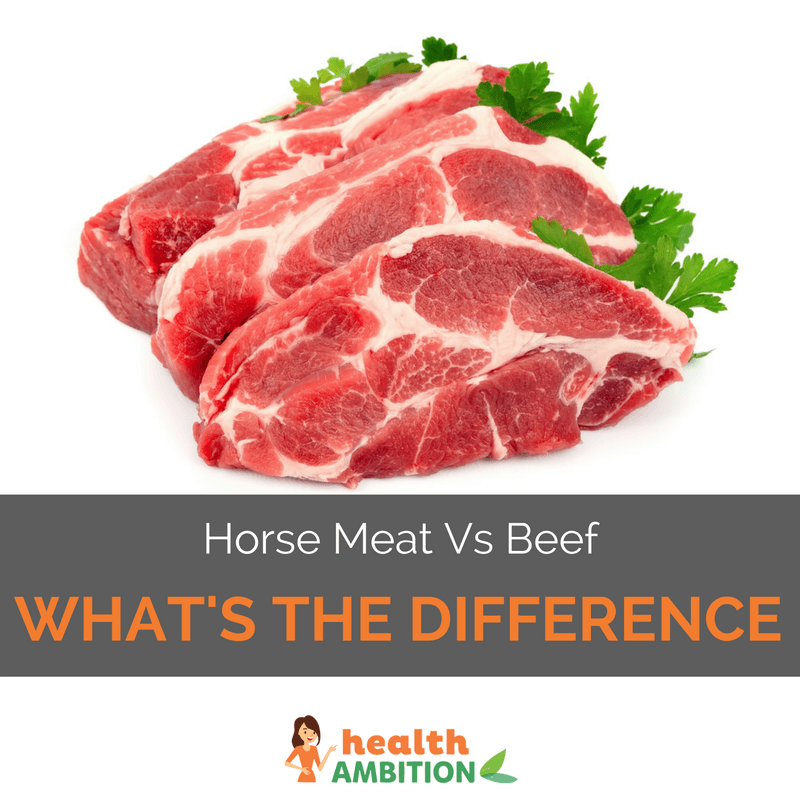 While it’s clearly deceptive for food companies to label a product one thing when it’s actually another, this page will explore what the difference is between beef and horse meat nutritionally. For now, even though it may be distasteful to some, what are the actual nutritional differences between beef and horse meat (assuming just this time that they really are what they are labelled as)? So should you eat horse meat? If you don’t personally have any moral objections to eating horse and you can find it humanely slaughtered in one of these specialty butchers, then I think the nutritional information on horse meat above has shown it is actually healthier than regular beef. Unfortunately, horse meat’s nutritional value and what you actually end up with in the vast majority of processed meat products are two completely different things. The recent horse meat scandal has provided some interesting insights into the way food companies source their processed meat. The horse meat found in the UK and Irish ready meals was originally sourced in Romania and Poland by a Dutch company (this Wikipedia article has the whole twisted tale) and tracing the source of the various different animal parts in a product can be difficult. A more significant problem though is the potentially dangerous additives used in the manufacture of processed meat products, particularly sodium nitrite which can lead to the creation of carcinogenic substances. In 2012, the World Cancer Research Fund released a review of over 7000 studies into the dietary causes of cancer. The report said ‘eating even a small amount of processed meats on a regular basis increases our bowel cancer risk’. And on the routinely used additive sodium nitrite, that it can ‘damage the DNA in our cells’. Another study by the University of Hawaii concluded that regular processed meat consumption increases your risk of pancreatic cancer by 67%. And diabetes researchers at Harvard University have discovered the compounds like nitrites and nitrates in processed meat interfere with the proper secretion of insulin and increase your risk of developing diabetes. Processed meat has other health issues worth considering too, such as the amount of actual meat in it. Off cuts of the slaughtered carcass that cannot be sold in any other form are generally used and many of us wouldn’t really recognise what’s ground up to make these products as real meat. In fact, the horse meat found in the frozen ‘beef’ lasagne and ‘beef’ pasta products would have almost certainly been by far and away the highest quality meat in the mix. Here’s an interesting video on red vs white meat. If you really are concerned about what you’re eating, you might want to look into just how processed meat is actually made. Many nutritional experts would say whether it is beef or horse meat is the least of your problems if you are eating processed meat regularly. I am going to try to be as kind as one can be when extremely pissed off! But honestly you disgust me and this article is horrifying!! Horses are NOT a source of food for selfish humans who have no sensitivity and humane discretion at all! our horses are animals that work for their rider because they love them; that have the capability in their heart and mind to LOVE someone. But obviously you wouldn’t know that based on your article! They are pets! Not food nor will they ever be. I want you to understand the gravity of what this is. Do you have a pet? Something you love that loves you back that will do anything to please you? Imagine me trying to legalize eating YOUR pet! Wouldnt that disgust you and hurt you? And to top this off how will legalizing this help anything or anyone I the united states?? Oh that’s right it won’t, in fact it will cause more problems. Why? because it will make burglers and thieves want to steal horses that belong to other people (who actually care about horse) for money. Why tho, oh yeah for the pleasure of selfish humans who want to “be healthier”. Whoever told you that this was an okay thing to do was WRONG hopefully you see that someday. And if you don’t ever well I pray that you realize how many hearts you believe in breaking! Sheesh, calm down. It’s not the Author who was the one who legalized eating horses, idiot. He merely pointed out factual nutritional values. Here’s a few facts for you. 1) You may be pissed off, but you have no right to in this case. Who are you to question the ethics of other cultures? Just because you consider horses to be pets, and thus ‘on a higher level’ than the chicken, beef and pork even you probably eat, it doesn’t give you the right to get indignant and all fussy over it. You can train a chicken and call it a pet too, you know? We just tamed the horses first in history because it was of more use to us as mounts in war. 2) “For selfish humans?” Really? You speak as if you aren’t one. Guess what? You are. You do selfish things too. 3) “And to top this off how will legalizing this help anything or anyone I the united states? ?” Horse meat is cheaper (almost half price) than beef. Ergo, it’s helping the poor, and is very useful in this state of economic inflation. 4)”because it will make burglers and thieves want to steal horses that belong to other people (who actually care about horse) for money.” Thieves… stealing horses. Now that’s hilarious. Even then, Horses have always been valued as pets, as you say. So, even if this hadn’t been legalized, thieves would still have ‘stolen’ horses (somehow, carrying it I guess) to sell to pet shops or for mounts or something. The article does not present a moral viewpoint on eating such animals. It explains the nutritional differences. They eat different things in different countries around the world. In Romania, horsemeat is eaten a lot. In France, snails are eaten. In Vietnam, dogs are eaten. In Iceland, Whale meat is eater. While this maybe be stomach turning to some of us, it’s a fact of life. Horse meat is already legal. The big scandal in the UK was that some manufacturers were selling beef products which had no beef in them and were actually horsemeat. This is clearly illegal and should remain so. I personally agree with much of what you’ve said and would never knowingly eat horse. I do wonder though whether you have read the whole article or just the title. I actually used a current topic in the news to illustrate that people were eating horse without knowing it, which is an issue we really should be taking up more with the big manufacturing companies, and just how unhealthy processed meat can be. Ultimately the article is not pro eating horse, it’s anti processed meat with the last paragraphs devoted to the cancer risk of eating this type of food. I appreciate you are passionate about this topic but I seriously doubt anyone reading this page would be inspired to go and eat a horse. Hopefully they would rather take a look at the sources of low quality meat in their diet and consider whether they are worth having given the health risk. If they do that then food companies will have less demand for it and will be less likely to use horsemeat as a substitute. Something I think most people would agree is wrong. But i and many of the people i know love a bit of horse meat, i can get it at about 10E a kilo, my kids will eat it over beef anyway and the taste is out of this world. you can even get it on-line now days . Ps: i live in France but this site is in the uk. Great informative article. I live in Belgium and have eaten horse products all my life. I love red meats, but beef is getting more and more expensive around here. So it’s nice to know that the horse meat (clean cuts) I buy for my family is not only cheaper and tastier, but also healthier. I eat horse meat a couple of times a month. Its content is great for people who lift and are tired of the chicken breast/beef/tuna protein source cycle. Btw Kyla, it’s sweet that you have your own fairytale viewpoints, but please don’t push your nonsense on others. Also, here’s a tip, learn to read and interpret an article without jumping to conclusions you hippie. Just come to this page after searching for information regarding the benefits of horse meat. I found it informative and hopefully, some of the information will be supported from other areas. It is however a shame that some are a bit narrow minded. It looks like I will be sourcing horse meat in the future as this does seem a balanced artical and clearly highlights the issues concerning our highly processed food. Hi Allen and thanks for your comments. I did find the horsemeat scandal strange knowing the state of the ‘meat’ usually found in processed foods. It has shed some light on how this kind of food is made though so hopefully it’s a positive thing in the long term. I recently tried a foal fillet during travels to Belgium, it was delicious. Nice to find out it is also nutritionally superior to beef. I wish I could find a local butcher who could supply me with this tasty meat. During WW II after 1943 the horse meat from the grocery store was of much higher quality than the beef, and it cost no ration points.